I love Easter! I love it! I remember loving it as a kid in Bradenton, FL (when I was under 5 years old so that shows you how much I loved it.) We use to drive past this house that we called the Easter Bunny house because it was decorated to the nines. (This was before people decorated for almost every holiday by throwing a couple of inflatables out in their yard.) And as much as I remember the Easter Bunny's house, I don't actually remember the Easter bunny being a big part of our celebration. I'm sure we did Easter egg hunts as kids, and I remember dying eggs with my mom and siblings. But really, most of my Easter memories must be from my teenage year post egg hunts and all that good jazz where our Easter treat was picking which flavor chocolate bunny you want by picking where you were going to sit at the table. Then mom would slap a post it note with your name on it so everyone knew who was whose during the week as ears and heads and tails disappeared off the bunnies. Therefore, to kick off our Easter festivities, Chris and I decided to host our own Easter supper here with other friends who's families don't live in town. 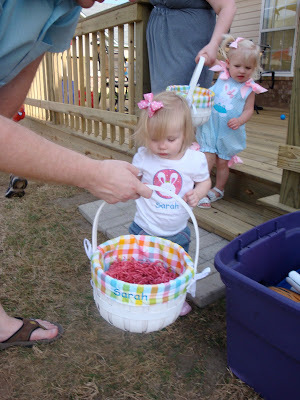 We threw and Easter Egg hunt and picnic potluck. I went NUTS making many deserts (and then in classic fashion failed to take a picture of my desert display I set up). I made 54 sugar cookies, 71 cake balls in 2 flavors: carrot cake and strawberry, and 24 chocolate cupcakes with Nutella buttercream icing. I was busy all week getting ready for this! Chris had it easy, he just had to make the mustard relish (divine) and glaze the ham. We set up the ball pit Sarah got for her birthday out on the deck for the kids to play with along with a new kiddie picnic table for them to eat at and a water/sand box that Sarah has been enjoying these past couple of days while the ground's been to soggy to get to the swing set. Getting her basket ready to hunt. She mastered the pitch into the basket for time optimization. Sorry for the overload, I couldn't get those picture to appear in Picasa for some reason to make a collage. Oh, and here's one more of Sarah hunting eggs with Chris. 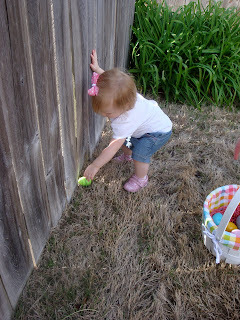 Then since we had such a good time hunting eggs with Sarah and thought it was the most adorable thing we had ever seen we called Chris's parents and asked them if we could do an egg hunt at their house too. I'm sure they were not please with me begging for yet another change in the plans (I had already begged them to have a family dinner Sunday on Thursday when I really couldn't take the idea of not being with family on Easter anymore.) But it was super cute and fun. 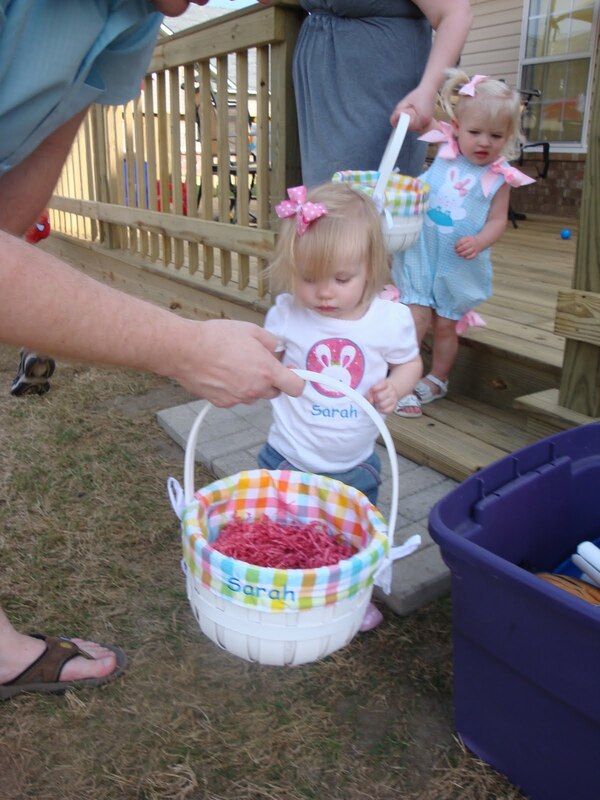 And Grandma and Grandpa Schwartz hid special eggs just for Sarah that had fruit loops inside since I don't let her eat candy yet. Sarah and 4H's getting ready to go egg hunting. 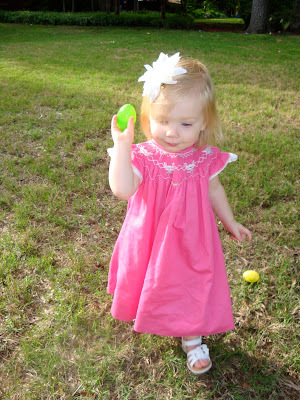 She stepped over the egg and then couldn't find it because it was under her dress. She looked around confused and then plopped on the ground to reach under her skirt and find it. 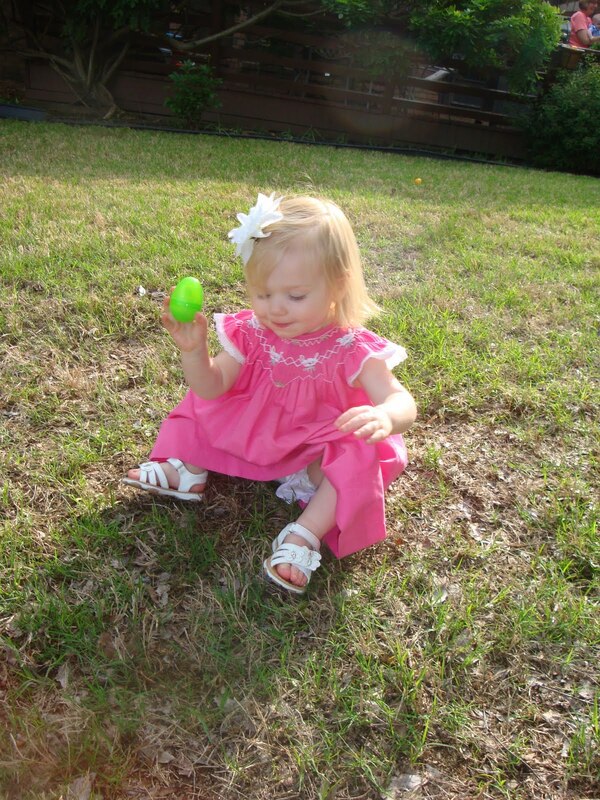 Carefully placing her eggs in her basket. Grandma Schwartz helping her collect eggs. I'm so very thankful for the Easter season and the opportunity we have to celebrate and remember the resurrection of Christ. While I love egg hunts because they're just good fun, what I love most is the Plan of Salvation and the Atonement and Resurrection and the opportunity we will all have to live with our Heavenly Father again because of this plan that was laid out and chosen by us before we came here. I hope that we can always keep the focus on Christ in our daily lives and not just in between picking up plastic candy filled eggs.